Imagine that you are a five-year-old princess of the Cambodian monarchy, living a life of luxury, surrounded by love and a large family. Then imagine that one day your family is violently jettisoned into the countryside with the rest of the urban population, and everything you know is destroyed. 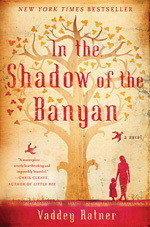 Finally, imagine what happens when the soldiers of the Khmer Rouge discover the royal identities of your family. We can imagine, but the author doesn't need to. She was that five-year-old princess, and this is her fictionalized story. It's a beautiful morning in Raami's world: almost a garden of Eden, with exotic flowers and butterflies, rustling silk, and the smell of jasmine in her mother's hair. She is the apple of her poet father's eye and is surrounded by the love of Grandmother Queen, her aunt Tata, and her pesky little sister, Radana. The only jarring moment is having to put on her leg brace, worn since her bout with polio as a toddler. But nothing dampens her childish enthusiasm, not the booming sounds in the distance, the worry in her father's eyes, or the talk of the servants about shortages in the marketplace. She is insulated, innocent, and secure. But by afternoon, things have changed. Om Bao, the cook, hasn't returned from the marketplace, the bombing is growing louder, and Grandmother Queen pronounces that "There will remain only so many of us as rest in the shadow of the banyan tree…." Later in the book, Raami reflects back to this moment. The prophecy, Papa had explained that day long ago when Om Bao went missing, said a darkness would settle upon Cambodia. There would be empty houses and empty roads, the country would be governed by those with no morals or teaching, and blood would course so high as to reach the underbelly of an elephant. In the end only the deaf, dumb, and the mute would survive. This day becomes the turning point that changes Raami's world forever. Gone the childlike innocence when she sees her first casual execution, gone the security of the beauty and peace of her childhood home, gone the safety of family who are always respected and obeyed by others. They are now at the mercy of violent, unpredictable, and ignorant boys with guns and the merciless voices of the Organization who promise justice while murdering the innocent. At first government officials and the royal family are targeted, then professionals, then servants who worked in the capitol, then anyone who could read or write, and even people who wore glasses. The enemy within must be destroyed, and Raami learns the hard way that her family is at the top of the list for re-education, forced labor, and death.